On way back to Stansted Airport earlier this week, I changed trains at Liverpool Street station, and stopped for a moment to photograph once again Frank Meisler’s bronze sculpture of the Children of the Kindertransport. It is a monument I have stopped at many times in the past, and it resonated particularly at this time as I reflect on my visit to Berlin the previous week. 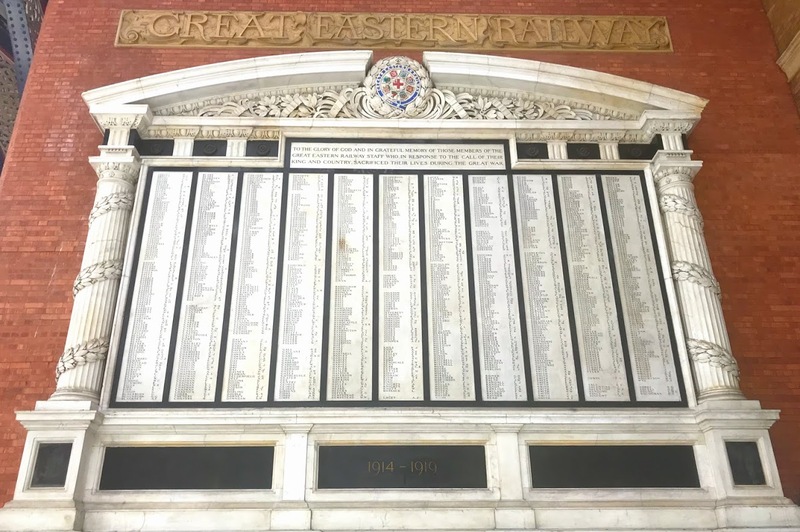 Then I was reminded of the impressive World War I Memorial in Liverpool Street Station, and thought it was worth visiting once again as we approach the 100th anniversary of the end of World War I. 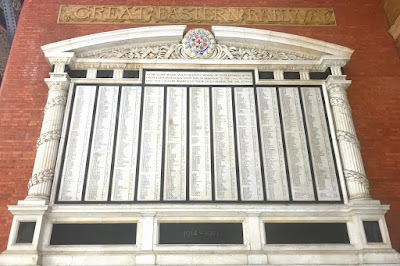 In the immediate aftermath of World War I, war memorials were erected to employees in many public places throughout the islands, particularly in railway stations. The war memorial in Kingsbridge/Heuston station in Dublin, for example, is in particularly good condition. 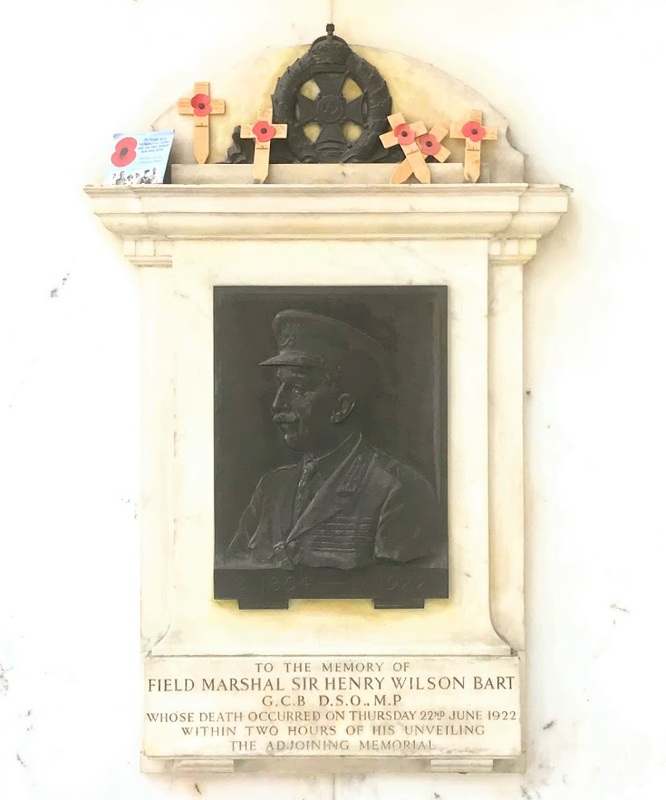 As I stood silently in Liverpool Street Station on Wednesday evening, I realised, of course, that Henry Wilson was one of the leading Irish-born generals during World War I. When he unveiled the memorial, dedicated to employees of the Great Eastern Railway Company, Wilson had recently retired from the army as chief of the imperial general staff (CIGS) and had been elected to the House of Commons as the Unionist MP for North Down. At Liverpool Street station, he spoke of the fallen, saying that ‘in doing what they thought right, they paid the penalty.’ Within hours of unveiling the memorial, he was assassinated on his own doorstep in Eaton Square by two English-born war veterans who had fought in World War I but who had become Irish republicans. Wilson was born in Co Longford in 1864 into an Irish landed family. The Wilson family traced its family tree back to an ancestor who landed at Carrickfergus with William III in 1690 and settled at Rashee, Co Antrim. The family fortune was made a century later by his great-grandfather, Hugh Wilson, through a shipping business in Belfast. When Hugh Wilson died, the inheritance was used to buy landed estates in Dublin, Westmeath and Longford, and Henry Wilson was born at Currygrane, near Edgeworthstown, Co Longford. Henry Wilson was unsuccessful in trying to get into Sandhurst and Woolwich, but he finally began a military in 1882 by joining the Longford Militia and training with the 5th Munster Fusliers. His time in the Boer War forged a life-time friendship with Field-Marshal Earl Roberts (1832-1914), whose family was from Co Waterford. Roberts became Wilson’s patron, and recommended him for the post of commandant of the staff college at Camberley in 1907. The Curragh mutiny in March 1914 brought Wilson to the fore politically. Brigadier-General Hubert Gough (1870-1963), who also came from a Co Waterford landed family, and the officers under his command at the Curragh Camp in Co Kildare, warned they would not obey orders they believed would coerce Ulster into a united Ireland and they threatened to resign. Wilson was one of the first to hear the news when General John Gough (1871-1915), younger brother of Hubert Gough, called to him at the War Office. The government, anxious to quash the crisis, provided a written guarantee that it would only order troops to assist the civil power in keeping law and order. Sir John French (1852-1925), later Earl of Ypres and Lord Lieutenant of Ireland and also from an Irish family, agreed that troops would not be used to force Ulster to accept the Home Rule Bill. Asquith considered taking disciplinary action against Wilson, but Wilson was now lionised as the ‘man who saved the Empire’ and became a popular figure on the political right. After the war, in June 1919, Wilson accepted promotion to field marshal, after Churchill had offered him a choice of promotion or a peerage. At 55, he was the youngest non-royal field marshal since Wellington. Wilson was also given the title of baronet, with the territorial designation ‘of Currygrane in the County of Longford.’ Over the next few years, he received honorary degrees from Oxford, Cambridge, Trinity College Dublin and Queen’s University Belfast. With his resignation, Wilson turned his attention to party politics Westminster, and in 1922 he was elected unopposed as the Unionist MP for North Down. He was then 57 and had spent 40 years in the army. He became the chief security adviser to the new Northern Ireland government, and Irish nationalists identified him with security policies in Northern Ireland, but wrongly linked him to Protestant sectarian attacks on Catholics. Wilson was a devout member of the Church of Ireland, and on occasion attend Roman Catholic services, but disliked ritual, especially among Anglican clergy. Wilson was in full uniform when he was murdered on the steps of his home at 36 Eaton Place, London, on 22 June 1922 by two IRA members, Reginald Dunne and Joe O’Sullivan. One report says Wilson turned on his attackers with the word, ‘You cowardly swine!’ The assassination came five months after the Anglo-Irish treaty was signed, ending the War of Independence and just a few months after he was elected an MP. Wilson’s assassination shocked the nation. It was the first assassination of an MP since the Prime Minister Spencer Perceval in 1812 and the last until Airey Neave’s assassination by the INLA in 1979. Wilson was given a state funeral, the streets were thronged with mourners as the gun-carriage bearing his coffin body moved through the streets, and was buried in the crypt in Saint Paul’s Cathedral, beside his patron, Earl Roberts. His murder led directly to the Civil War in Ireland, but to this day no historian has determined with satisfaction who ordered the murder. The British government blamed the anti-treaty rebels, then occupying the Four Courts in Dublin. The British told the provisional government in Dublin to deal with the Four Court rebels or they would deal with them. Under pressure from the British, Michael Collins borrowed two 18-pounder guns from the British army and shelled the Four Courts, leading to the Civil War. Some historians have speculated that Collins ordered the assassination of Wilson before the treaty and forgot to rescind it. Some suggest it was a provocative act to give Collins the carte blanche to attack the Four Courts garrison. Scotland Yard investigations centred around the involvement of Sam Maguire, Collins’s chief intelligence officer in London. Others suggest Dunne and O’Sullivan acted on their own, believing it would provoke a British retaliation and unite nationalists who had been bitterly divided by the treaty. Dunne had been in Dublin visiting Collins and Rory O’Connor in the Four Courts a week earlier. Dunne and O’Sullivan were caught by an angry mob shortly after the shooting. Both were born and reared in London, and were army veterans. O’Sullivan had lost a leg at Ypres, but both men went on to join the IRA after World War I. At their trial, the two were prevented from making a speech from the dock. They were hanged on 10 August 1922. Twelve days later, Michael Collins was killed in the Irish civil war. The Wilson memorial in Liverpool Street, erected in 1922-1923, is the work of Charles Leonard Hartwell (1873-1951). It includes a bronze portrait mounted on marble tablet, and is signed in the bottom left corner of the relief panel, ‘C Hartwell ARA.’ Later Asquith would say Wilson was ‘not a man whom I would trust,’ while Lloyd George considered him ‘an intense and intriguing politician all the days of his life’. Wilson’s reputation was ruined in 1927 with the publication of an official biography that quoted extensively and injudiciously from his entertaining, indiscreet, and wildly opinionated diaries. The bodies of Dunne and O’Sullivan’s were brought to Ireland in 1967, and reburied in the Republican Plot in Deansgrange Cemetery, Dublin. Sean Mac Stiofain, who was to become the Chief of Staff of the IRA, delivered the main oration, and an IRA firing party emerged from the crowd and fired a volley of shots over the graves. The futility of war. Thank you for this post. As an American married to a Belfast man whose father and uncle fought in the First World War, I am still perplexed by the complexities of this period in the history of Ireland. We lived in Dublin for more than 40 years 1968-2010 and visited Belfast regularly.